So you want to take your little doggie along with you on vacation? Do you now? Really? Before “hitting the road” or flying the “friendly skies” you need to know that taking your doggie on vacation is THE SAME THING AS TAKING ALONG A SMALL CHILD!!!! A doggie will need your CONSTANT care and attention. They can’t be left in the hotel room while you go out sightseeing all day long…and then left again when you go out to dinner that night. If this is your plan, then PLEASE leave them at home with a responsible person to care for them so they will be properly spoiled…not ignored in strange surroundings. Although I am ALL ABOUT FASHION, no doggie looks good when they are sick or injured. I shudder to think that the puparazzi might snap off a few dozen shots of me getting sick off a curb somewhere! What if they caught me limping along in Central Park because of a paw blister?!?!?! It would be a great idea, to right now, before you even have a trip in mind…get a little first aid kit all set up for little Fido or Fidette…that way, if a trip should pop up at the last minute, your doggie first aid kit is ready to go. You can make these kits as simple or as complicated as your little heart desires. 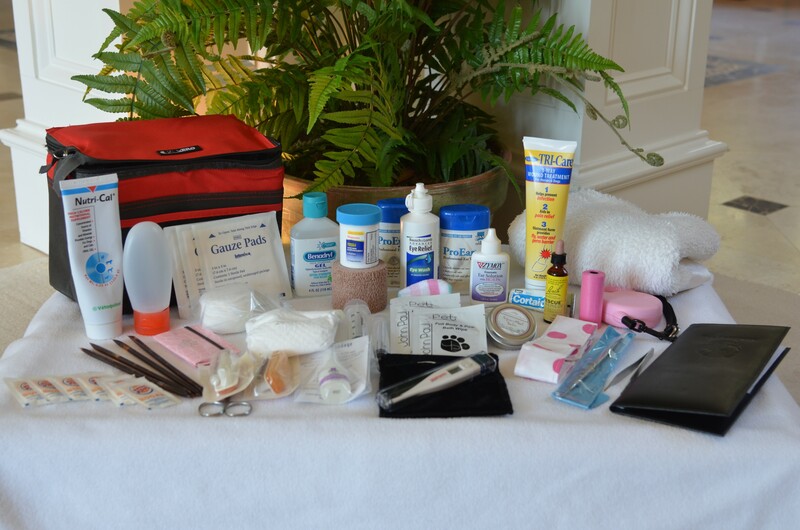 Just remember, you are not stocking a hospital…you just need a few basic supplies to handle a SIMPLE emergency. If the situation is anything more complicated than your kit can handle, you should be rushing your doggie to the nearest EMERGENCY VET CLINIC. If the sight of even DOGGIE BLOOD makes you faint, then just stock your kit with a few very basic things that will provide comfort until someone with a stronger stomach can handle the situation…but at least you will have something on hand to diminish any pain. Listed below are just SOME things to consider for your kit…these are what my Mummy has in MY kit. She keeps all of this in a red zipper cooler bag that she found at Walgreens. It is the very first thing that gets packed into my suitcase whenever I travel with her…which is basically whenever SHE travels! If anything should get used on a trip…she replaces the item as soon as we get back home so the kit is always stocked and ready for the NEXT trip. A copy of my medical records from my vet…this also has the vet’s phone number at the top in case an Emergency Clinic should have to call him for any further information. A collar with tags/microchip…If your doggie is micro-chipped, before going on a trip you should call the microchip company to make sure that your number is still registered to YOU as the owner. Some people have mistakenly thought the dog was registered, when in fact, they forgot to even register with the company…so the microchip shows up as having NO OWNER at all. Please call and check. Also, you should have your vet SCAN this chip to make sure that the chip is still in good working order and that the proper number is displayed. Write the chip number on your paperwork too. Sugar packets or sugar products such as honey sticks or Nutrical for hypoglycemic events. Even if your dog is not prone to such events…sometimes just the STRESS of a new experience can bring it on. 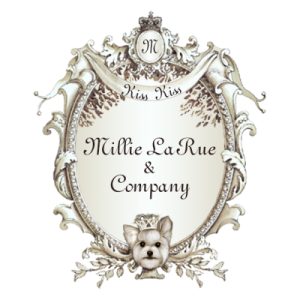 If your doggie seems very lethargic or unresponsive…. rub some honey along his/her gums…or make a paste from some table sugar in an emergency. Nutrical is a product sold in pet stores…it comes in a tube and dispenses a highly concentrated thick glucose solution. You should never be without something like this….even at home. Whenever I travel, Mummy even adds a tiny bit of sugar to my drinking water to make sure that my glucose levels don’t get too low just in case I get too stressed. Syringes for dispensing water into my mouth in case I should ever be too weak to drink, or if Mummy feels I have not had ENOUGH to drink for the situation. Now, chances are…you will never have to use any of these things. I think I have used the eyewash a few times, and Mummy has some paw cream to soothe my little foot pads after days of walking long distances…and I like to eat the treats from the little treat bag, she always packs those FRESH each time we travel…so I get to eat them up on each trip…but I think that is all we have ever used from our kit. Traveling with your doggie is FUN, FUN, FUN! You will LOVE IT! We have met so many wonderful people and doggies, and enjoyed every single trip…but it’s always best to BE PREPARED and the trips will be less stressful in the event of a slight mishap. Mummy knows that as a top fashion model, I MUST be seen looking my best at all times…so for little me, the first aid kit is a MUST HAVE! Like I said, this kit is no substitute for quality medical care in serious situations…but sometimes all you need is just a little TLC…and a bandaid. 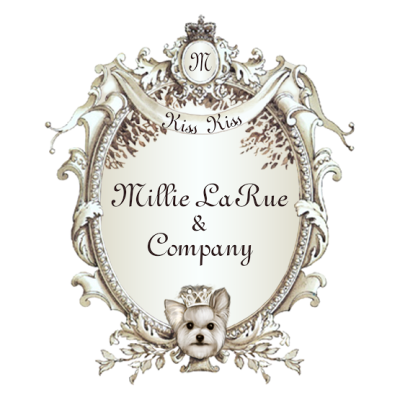 In Part II of “Traveling With Your Doggie,” I will talk to you about packing the proper fashion essentials…because of course, you want to be seen with the “in crowd’ and be “in fashion” too! These are some great things that your Mom packs for you Millie! Some of these I never would’ve thought about. Thanks for the info for the next time Lulu and Olivia leave home on a trip. Great ideas for a travel kit! Many I keep, but some I would have never thought of. Thanks for the great article and information! Great Info! We will be traveling this winter and will be sure to pack our Kit. !